India is ranked 139 from among 194 countries for which data is available. The World’s average LEB is 67.2 years (65 for men and 69.2 for women). There are 15 countries with LEB of >80 years (Japan tops the list with 82.6 overall and 86.1 for women), about 100 countries with LEB between 70-80 years (USA is ranked 38th and Russia is ranked 137th ). The lowest LEB is in Swaziland at 39.6 years. The last 50 countries in the list are all from Africa (except Turkmenistan, Bangladesh, Nepal, Afghanistan, Papua New Guinea). Even though, India stands low in terms of LEB among all nations, the fact remains that (i) there isn’t much difference among the nations- a difference of 2 years covers almost 50 countries and (ii) there has been an impressive improvement in LEB since independence. The age of retirement in India at the time of independence was 55 years (common for both men and women) and has been increased twice since then. It was made 58 years in 1962 after the war and was again increased to 60 years in 1998. · The increase of the retirement age is the most simple way of strengthening the financial stability of pension system due to the decrease of the expenses part of pension system (reduction of the duration of the period in which the pension payments are made), and increase of its revenues part (increase of the duration of the period in which the pension contributions are paid). In other words, the increase of the retirement age leads to the reduction of the pension burden due to the increase of the number of able-bodied population and decrease of the number of old age pensioners. · The Government, by increasing the retirement age will also defer by that many years the liability of paying pension to employees who were to retire otherwise at 60 years. While salaries will have to continue to be paid, this will be cheaper than paying upfront benefits like gratuity. The fiscal deficit is 6.8 per cent of gross domestic product this year and a two-year lag in paying pensions will help in bridging this. In 1998, when the Government had raised the retirement age from 58 to 60, a move that benefitted 90,000 government servants and 50,000 defense personnel, the retirement of 140,000 employees would have cost Rs 5,200 crore whereas paying salaries costed only Rs 1,493 crore. · With the increase in longevity, the number of years an able bodied person can work effectively also has gone up. Retiring them at 60 years imply that the person sits idle at a time he/she could have worked for another 5-8 years effectively. In the conditions of gradual population ageing and the possible increase of the life expectancy, the retirement age has to be increased sooner. · Due to increasing urbanization and economic & space constraints, there has been a move towards nuclear families and looking after the aged, especially, if they are not working and ‘dependent’ is becoming a major problem. The numbers of old age homes are increasing. The fact that people are not looked after well in their autumn plays havoc with their dignity and it is distressing seeing them compromise towards the latter half of their lives. It is in this regard that it makes a perfect case to increase the retirement age by at least 5 years by making it 65 years. · There is also a logic that the State Governments and Private & Corporate Sector will follow suit once the retirement age is increased by the Central Government. Now let’s look at the arguments against increasing the retirement age. 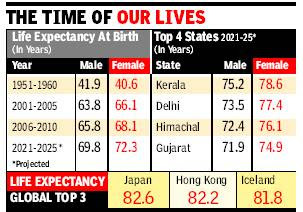 India is becoming a country of ‘young people’ with the population bulge in the age group 20-35 years. As a result, the labour market is getting more competitive and the unemployment rate has been on the rise. The issue of depriving these young people of what’s their legitimate claim on employment by postponing it by the number of years the retirement age is pushed further up comes in. · However, equivalent vacancies are not automatically guaranteed with retirement. There has been a trend since last decade, to ‘right size’ (downsize) the employment and number of jobs, arising out of retirement or additional requirement has been minimal. As such, it makes strong sense to increase the retirement age. · I strongly feel that retirement age should be increase by 5 years from 60 to 65 years. Alternatively, it can be done in two tranches – from 60 to 62 years now and from 62 years to 65 years in 2025. 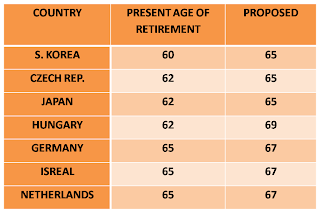 What is interesting is that in developed countries like the US, most people are against increasing the retirement age. Governments have failed to increase it in spite of the need to do so due to popular resistance.